Designed by Peggy Davies. Ellen Terry. High-fired stoneware pottery Large 'CROCK Shaped' Canister or Cookie Jar in BLUE WITH PINE TREESDesign. and our Youtube channel at 'Anne Karakatsoulis' for more photos. Studio Pottery Blue And White Tabby Cat. Aller Pottery. condition with the Aller Pottery, crossed [ A ], and Bryan's personal. Bryan Newman. Bryan Newman. Bryan wheel threw this pot with references back to the Korean source that. the glaze palette and imagery. Strange little hand potted money box. Unusual glaze. Tallest point is 7.6cm. Really unusual and unique covered pottery serving dish with hand painted colorful fish and water. Very heavy with a vent hole in the top of the lid. 14 1/4" from handle to handle and is approx. 7" tall to top of handle. Really nice modern turquoise blue vase. In perfect condition, it stands 24" high and is approx 10" at widest point. Chelsea Studio Pottery, Large Dish with birds nest - Beautiful! This sale is for a fine example of Chelsea pottery on the big tripod oval tray. It is marked to the base as it should be, and has the artists signature. This is one of the better pieces, and would make a great addition to any serious Chelsea collection. 20TH CENTURY ALAN WALLWORK VASE. ALAN WALLWORK VASE SCULPTURE. Stoneware vase signed with initial to the base. ABOUT 18.5CM TALL. KP Studio Potteries Table Lamp. Such a lovely little pitcher. Unique design with a green stem as a handle. I think this might be a squash but not 100 percent sure. Handle does appear to have been glued back but really doesn't take away from it's beauty. A wonderful sculpture with amazing detail. Purely decorative. A woman in a cloche hat floating in a bowl. Excellent condition, unsigned. 6.5" tall x 8.5" long. Bill Campbell Pottery Bowl B48 new! Beautiful! You can see the influence, a very beautiful piece of functional art pottery. Taylor was known for his clay alterations, this pot is an excellent example of his work. Marked with Taylor's mark on the rim and the base. This pair of ceramic 7 3/4" tall candlesticks are hand painted and signed on the bottom by the artist, Drewsen. One depicts a puffin and the other a gannet. Both of these birds are native of Foroyar, Norway, Greenland, and Iceland, which is where I am sure the artist is from. BERNARD ROOKE SITTING HARE This fabulous portrayal of a hare stands 26cm tall to the top of the ear with a base length at its longest point of 16.8cm. Bernard Rooke was born in 1938 and studied at the Ipswich School of Art and then at Goldsmiths' College London. The design is representative of the distinctive Rooke style and shows fabulous moulding to the surface. Please look at the many photographs and read the condition report to satisfy yourself to condition and style. Thank you for looking and please view our other quality listings, including other examples of Bernard Rooke's work fresh to the market from a collector. ABOUT US We aim to sell quality authentic antiques and collectibles to the discerning customer. PAYMENT We accept paypal, personal cheque or postal order. Lovely Helmsdale Studio pottery Duck hand made by David and Penny Woodley At Helmsdale pottery Sutherland Scotland. My family lived in Zimbabwe during the tumultuous late 1990's. Amazing Penzo Pottery Collection. Penelope (“Penny Penzo”) Vincent is a world-renowned Artist and her works of art are instantly recognisableby her ceramic illustrations. It is a beautiful hand etched horsehair pot depicting a beautiful design. 2 3/4" Opening. Chelsea pottery footed dish depicting a cockerel. signed and probably by Joyce Morgan. FREE pick up can be made from TQ1 and cash on collection is acceptable. Illumine Art Pottery Studio Pottery Arts and Crafts Vase MINT! Very well done arts and crafts studio pot by Illumine Art Pottery from San Antonio Texas. Vase has hand tooled leaves and excellent glaze. Mint and very clean with no repairs. Height is 8-1/4". MUD DABBERS POTTERY. Incised on the bottom: Mud Dabbers, Bee logo and Balsam, NC. It also has a mark on the side at the bottom edge. That one I can not make out though. BALSAM, NC. 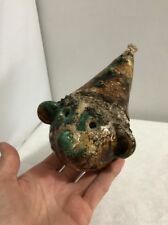 I know this is a functional piece of pottery. Peters Pottery Madonna Virgin Mary Nativity Christmas Mississippi 11"
Peters Pottery Mississippi Madonna. 11 in tall. This little handled dish is signed Sanguino 25 and is in excellent condition. There are no cracks or breaks and the design is in great condition. I have shown close-up photos. It is not mis-shaped, just the way it looks in the picture due to the various facets. It is in excellent, unused, condition and has no issues. Height is 4 1/4, the top is approx. 3 5/8 wide and it is 2 1/8 wide on the foot rim. Girl with bunny - great Easter gift! This is a vase and matching pomander featuring a snakeskin textured design in blue. A modernist glazed terracotta studio pottery hedgehog with individual spines. Artisan handcrafted soneware pottery blue footed bowl with knob lid. Measurements of bowl are approximately 6.5" diameter and 2.25" tall. Lid is approximately 6" in diameter. Handmade and signed, raku pottery wall dragonfly. Gift boxed, with a Raku card. Makes a great gift. Multicolor Raku Horse plaque. Approx 5" tall, 4.5" wide, with a hanging loop on the back. You have found the missing pieces to your china pattern! Here is a delicate bowl and saucer set from Mustardseed & Moonshine in a purple floral pattern. The bowl is 3" tall by 5 1/2" wide. The leaf shaped saucer is 5 1/2" x 7 1/4". Very good pre-owned condition, no cracks, but does have a Chip on the Rim & 2 Fleabites (see Pictures). Please see our Not Just China Store for more of this pattern. We try to ship within 24 hours of receiving payment. If you have questions or you feel there is a problem, please e-mail us. We will normally get back to you within 24 hours. Thanks for looking at our store!. Monster of a beautifully crafted abstract primitive free-form redware vase with Albany slip-like brown glaze interior that shades to a deep chutney brown at the inside bottom, with superb rutile streaks done on a wonderful mottled purply blue semi-gloss glaze. Cooper Pottery Pot Pourri Pot/Vase Impressed CP Mark 10cm In Height Height: 10cm approx Condition: please view photos carefully for condition (no chips or cracks). Any questions please feel free to ask.